On the software side, to run the ‘smart brew’ function a make espresso button press is emulated, and the mass of the brewed espresso is constantly measured. Once the argument’s ‘target output mass’ is reached the firmware shuts off the machine. Brew time is then reported, allowing [Ross] or others to adjust the grind of the espresso beans to fine-tune to the recipe. The next step is to phase out the human element of adjusting the grind — luckily there are some perfectly hackable solutions there. Fine espresso will fuel that endeavour in the meantime! Bloody hell just working on one of those machines is torturous enough let alone fitting in extra components ! thank you! yes, it was definitely a pain. the project is still underway, and we have some fun ideas we are looking to add. Some days I feel like a little extra is needed, so I just grind a little longer. Melita filter cone under a push button “pod” maker. My thoughts exactly. The Lunar is a BT enabled scale that can be linked via its API to anything that’ll communicate with it. I have no idea how they did it but anything more than a µC with a BT module and a relay is overkill. I’ve been on the hunt for a GS3 for years but haven’t been able to find one defective enough to fit in my budget. You’d probably be better off finding a used full size Linea you likely be able to get one cheaper than a GS3. I have a thing for the new Linea’s, but I’d take a single group Linea any day of the week. Not a fan of the Linea Mini though. The issue with Linea’s is usually the fact that it’s a 380v (EU) or 220v (US) machine, not something that you hook up to a normal outlet. 240V US is easy, most people who have plumbed in setups probably already have dedicated electrical to their coffee bar, I know I do. IN that case switching to 240V is as easy as switching to a 2 pole breaker and you get 240V for your machine. TBH, it wasnt as easy getting the lunar to communicate. Its not a published API, and eventually we had to get acaia to provide us a specific BT chip and firmware. we are trying to get them to make the API public, but it will take time. we have another version running on a load cell, but this “waterproof” version felt more straightforward. I was under the impression that the API was public from the get go? Admittedly I’ve never looked into it as the Acaia scales simply are too rich for my blood. no need to buy a GS3, you are absolutely welcome to come hack on our machine any time you are in SF! we had planned to reverse engineer the full atmega control board, and actually found the serial comms port. unfortunately the machine is pretty old, and when used a logic analyzer and eventually an oscilloscope, i swear this was running at like 1200 baud with some inverted bit, or something even more ridiculous. the commands coming off the LCD button board with indecipherable. at that point we realized it would be MUCH easier to just use a relay to trigger the on/off button for starting espresso. BUT, don’t worry, this is a series of hacks we are working on. 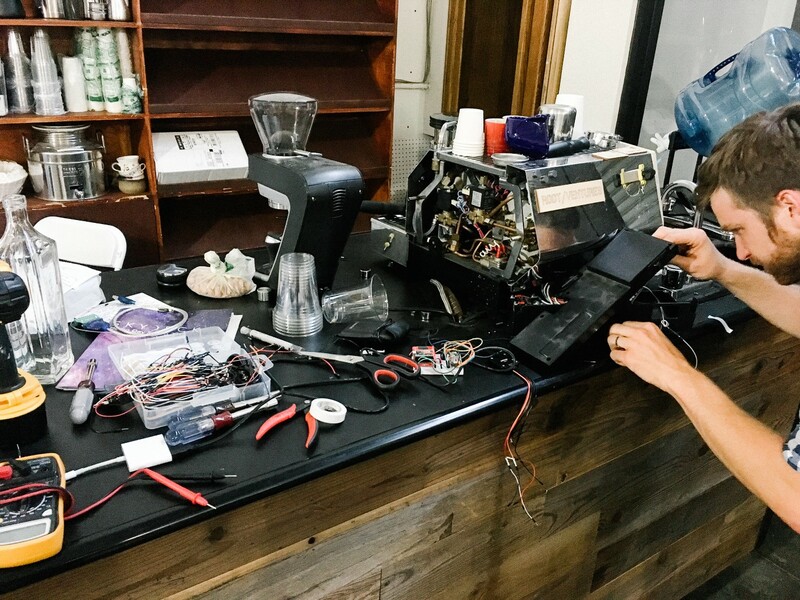 the next step is a stepper motor to control the grinder and yield a continuous adjustment to the coffee over the course of the day to compensate for humidity and temp changes. What he did is already commonplace on more than one commercial machine. La Marzocco calls is “ABR” Auto Brew Ratio, which is marketing for brew by weight to scales built into the drip tray under each group. This has been done for years now. And how much does that feature cost? ‘Cause even crapsack espresso machines are pretty out there. $14,000….or about 700 particle photons. $14,000 is a gross exaggeration, the cost would be whatever the ABR Linea PB costs over the cost of a Linea PB without that feature. Probably $3000 if I had to take a wild guess. yep. EXCEPT, because the ABR feature exists silo’d on the machine, it cannot tell the grinder to make any adjustments. our next step is to send a command to a stepper motor that will appropriately adjust the grind to finer or looser based on the last shot. That’s cool just for the sake of it, but that’s a step too far in automation for my taste, great if you want to build a superauto where soccer moms can push a button for a great espresso, not great if you actually enjoy the art espresso. but, dont dare compare this to a super auto. we control what the “button” does, and therefore can make every adjustment we want to the taste profile we are looking for, and then have ultimate repeatability. You’re supposed to measure the mass of the coffee used? I just put in as much coffee as I can fit in the basket, although I’m sure that will make coffee snobs cringe. I guess that’s where the expression “Give it the beans” came from. What is snobby about crafting a recipe and then making it? It’s elementary to weight in and out and its been an industry standard for many years now to do so. Bakers don’t just throw in random amounts of flour to make a cake, cooking has always involved measuring. It’s okay, I’m also a proponent of the “just cram it full of grounds” school of thought. It’s just a drug delivery system to me, I don’t care how it tastes. Just give me that crack so I can get back to work. I’ll eat the beans if I need to. Existence is an absurd and vulgar march into a cold oblivion. That said I totally see the merit of those who actually measure the mass, temperature, pressure, time, etc. and get it right. Good for them, I won’t balk at that. sometimes i eat a handful of instant coffee. my method is nearly effortless and i like the crunch.